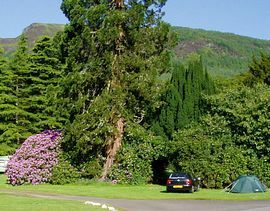 This quiet award winning family run park lies within 22 acres of mature woodland, the grounds of the former Glendaruel House. You will find a place to unwind and relax or get on your bike! Watch the red squirrels and discover waterfalls and walks. You have a choice of owning or hiring a luxury caravan holiday home, we also welcome tourers and tents. Good facilities include a well stocked licensed shop and there is a choice of excellent eating out nearby. Various local discounts have been arranged for our visitors. This is an ideal base to explore Cowal, Bute, Kintyre and The Loch Lomond and Trossachs National Park. 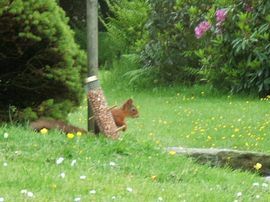 Watch the Red Squirrels and blonde rabbits from your pitch. Enjoy local produce including beers & venison from the park shop. There are two main routes into Cowal and to Glendaruel. Head to Loch Lomond follow the A82 to Tarbet then the A83 through Arrochar and over the 'Rest and Be Thankful' just before Cairndow turn left onto the A815 down to Strachur then take the A886 along the shore of Loch Fyne and over the hill down into the valley of Glendaruel . 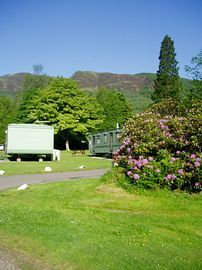 The entrance to the caravan park lies on the left approximately 13 miles south of Strachur. Head down to Gourock and take the ferry across to Hunter's Quay, Dunoon. * Turn right out of the ferry terminal and follow the coast road and turn right onto the A815 through Sandbank. Turn left on to the B836 (sign posted to Tighnabruaich) and follow the single track road until you meet the T junction with the A886. 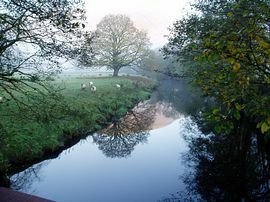 Turn right and head north for approximately 4 miles, the caravan park lies on the left hand side. Note: This route has a 1:5 uphill gradient and passing places. If you are towing you may prefer to continue on the A815 along the side of Loch Eck to Strachur Turn left on to the A886. * We are able to offer reduced rate tickets on Western Ferries please telephone (01369 820 267) for details. ** If using GPS do not turn off the A886 until you see the Caravan Park Entrance Sign. There is not vehicle access to the park from the West Glendaruel Road and it is not suitable for towing a caravan! Caravan Holiday Homes for Hire from £300.00 - £375.00 per week based on occupancy of 4. Short breaks available (minimum 2 nights) from £50.00 - £65.00 per night. Backpacker or cyclist with small tent £6.00. Park Opens 1st April - 31st October. Caravan Holiday Home Owners 1st Apr - 31st October and 1st December - 31st January. Scottish Thistle Award 2005 Best Caravan and Camping Park - Customer Care.